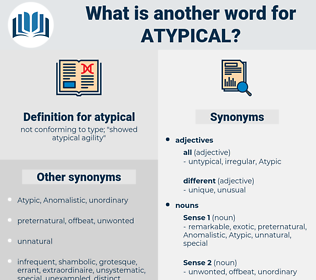 What is another word for atypical? 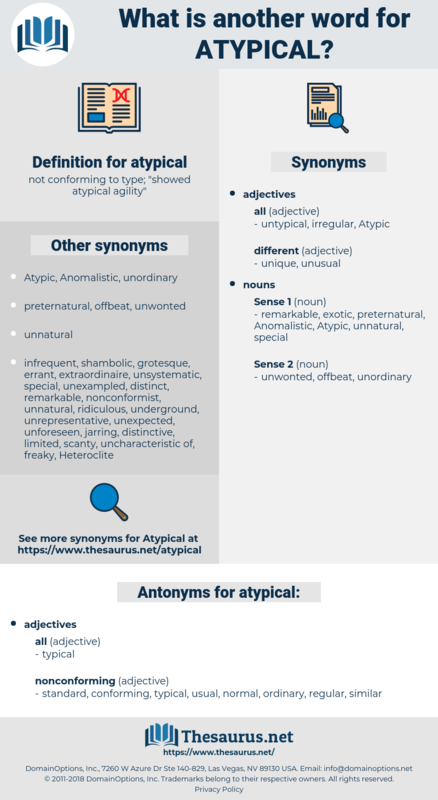 not conforming to type; " showed atypical agility"
exceptional, informal, abnormal, nonstandard, classical, mysterious, characteristic, anomalous, quintessential, exemplary, shadowy, aberrant, respiratory. ordinary, conforming, normal, standard, usual, similar, regular. exemplary, wonted, common, run-of-the-mine, natural, true, customary, commonplace, unremarkable, run-of-the-mill, typic, workaday, routine, veritable, frequent, emblematic, everyday.